There’s alot for an environmentalist to feel hopeless about these days, from calls for the militarization of the Arctic Ocean as a response to the melting polar icecap to the prospect of our local chapter of the Sierra Club running out of money. So I decided to take a little trip to Nipomo to express a treasurer’s appreciation to a donor whose generosity has allowed us to keep going for one more year, and also to get my spirits raised. 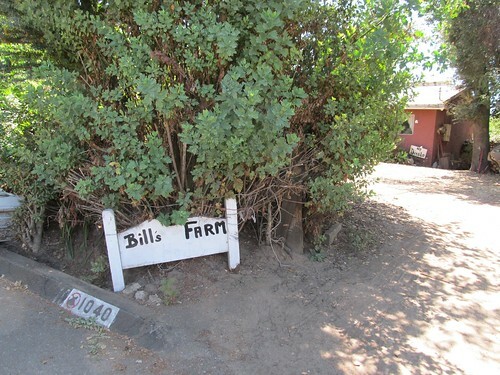 “Bill’s Farm” looked no worse for the wear since the last time I stopped by three years ago. I noticed an ancient carriage almost hidden by the gaggle of bicycles kept here for the use of his hostel visitors from all over the world and the array of solar panels on the roof setting off the “No Diablo” sign by the corner of the house. I was welcomed by a high ringing voice, and once inside surrounded by walls and tables completely covered with pictures and clippings. 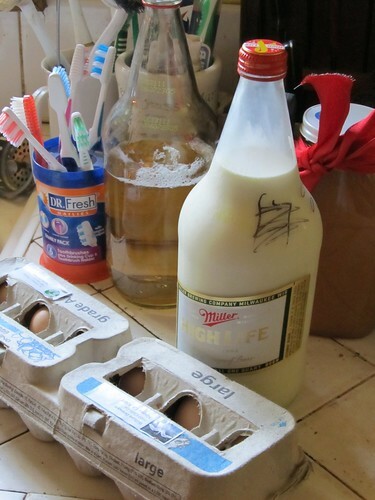 On the counter was a half-empty quart bottle of beer next to another one full of milk. 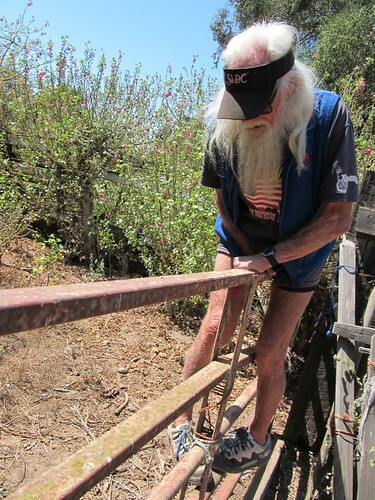 “Just did the goats,” giggled the man with flowing white hair, cascading beard, cabled arms and frighteningly tough legs revealed by his short-shorts. 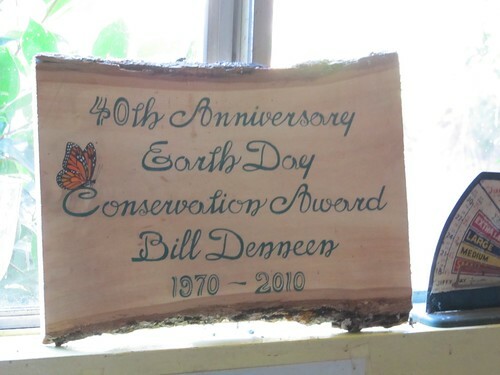 The phone rang and he spoke briefly to someone about the Santa Maria Times article on the table that reported his $500 environmental award to the graduating High School Senior who’d volunteered in the Nipomo Native Garden and was now heading for UCSB. “These young people inspire me,” he said. They’re our only hope. I’m 86 and starting to lose it, but they carry the torch. 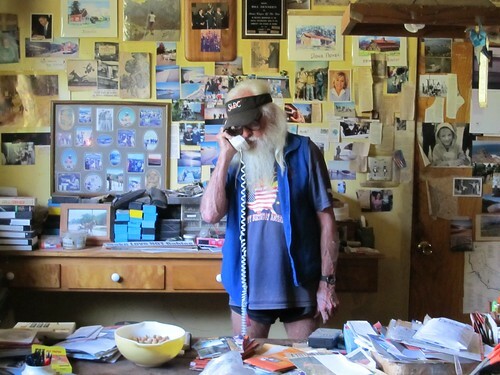 Here’s another one of my heros,” he declared, pointing to a picture of Jordan Hasay: “While I was doing a triathlon a couple of years ago and just ready to throw in the towel, she came up behind me. ‘You can make it,’ she said, ‘just keep going.’ And she was right. That must have been 20 years ago, when my father was just about Bill’s age now. “How old are you?” he asked. On my way back to the car weighted down with eggs, milk and fruit, I felt lightened. Instead of dreading yet another meeting to discuss grant applications, budgets, and liability insurance, I was eager to share Eldr Bill’s harvest with the volunteers at the potluck that night. It may be of interest to readers who shop at Trader Joe’s that the company has agreed to shift all its seafood purchases to sustainable sources by December 12, 2012. This decision came after a campaign called “Traitor Joe’s,” mounted by Greenpeace, pressured the company to abide by the Monterey Bay Aquarium’s “red list” of species to avoid. Trader Joe’s had refused to do that and didn’t reply to e-mails from customers back in February, but I just discovered an update on their website stating the intention to “address customer concerns including the issues of over fishing, destructive catch or production methods, and the importance of marine reserves.” Hooray for Greenpeace, for Trader Joe’s, and for its customers. This is a win for San Luis Obispo. Jan will serve effectively and humanely. She has the talent, the experience and the dedication to do an excellent job as mayor, leading and representing the City—which according to last month’s newspapers is both the most desirable place to live in America and is about to fall off a cliff. Either way, it will benefit from her leadership. It’s a win for her, because it provides the opportunity to fulfill not an ambition, but an ongoing mission of public service and leadership. When I first met her 44 years ago as a junior at Stanford, she organized a campaign to get women equal rights with men to live off campus at much cheaper rents than those in the dormitory. This involved facing down the President of the University who wasn’t eager to lose the revenue provided by the policy of protecting female purity. When we lived in the wilds of British Columbia during the 1970’s, she helped found a satellite campus of a community college and became its first director. When we moved back to California, she got a job as Director of Graduate Student Housing at Stanford and devised a network of neighborhood coordinators—now called Community Associates–which still remains vital. While attending Law School, she organized the mature returning students and then took a part-time job as a law clerk involving the preparation of a landmark Supreme Court case assuring equal opportunity for women in the workplace. 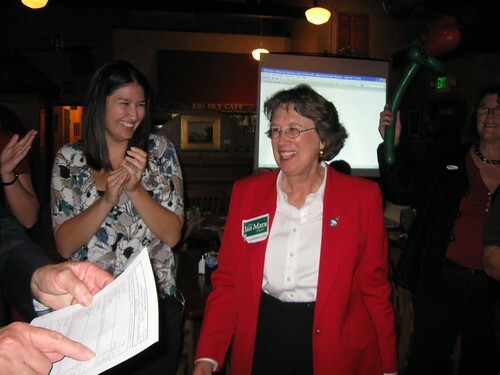 When we moved to San Luis Obispo 22 years ago, she immediately embarked on a course of public service that led to appointment to the County Parks and City Planning Commissions and to her election to City Council in 1998 and again 2008. All of her political and humanitarian work in this place has been volunteer or for minimal pay, for she’s been able to make her living as an attorney. The mayor’s job will allow her to use and expand abilities cultivated over a lifetime. It’s a win for me, not only for the reflected glory—imagine the pleasure I’ve taken in knocking on thousands of doors and telling whoever opens them about the virtues of the woman I love, and in posting hundreds of signs of tribute to her all over town. But also imagine what it would be like to live with someone this energetic and smart whose time was not occupied being in charge of a whole city. So here’s to our new mayor, and to this fleeting moment of triumph, and to all of you who contributed in one way or another to make it happen.